Zero Mass Water has created hydropanels that use solar panel electricity to pull up to 5 liters of water from the air every day. Ambient air is drawn into SOURCE via fans and water vapor in the air is adsorbed onto our specialty hygroscopic material. The water vapor is collected as the airflow passes through a condenser and the resulting liquid water flows into the onboard reservoir. The collected water is mineralized for optimal health/taste and treated (with Ozone) to maintain optimal water quality over time. Water is pumped through a polishing cartridge prior to being dispensed to the customer. 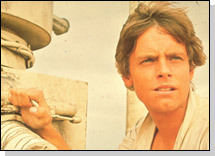 Come on - you thought about moisture vaporators of the desert farms of Tatooine, didn't you? Two figures whose concern was obtaining that moisture were standing on the slight rise of one of those inhospitable flats. One of the pair was stiff and metallic -- a sand pitted vaporator sunk securely through sand and into deeper rock.